The Global Volcanism Program has no activity reports for Grímsnes. The Global Volcanism Program has no Weekly Reports available for Grímsnes. The Global Volcanism Program has no Bulletin Reports available for Grímsnes. Grímsnes is a relatively small volcanic system located SE of Thingvallavatn lake. It is displaced about 15-20 km to the east of the other en echelon group of volcanic fields of the Western Volcanic Zone extending across the Reykjanes Peninsula. Its lava flows cover 54 km2 and were erupted from a group of 11 fissures that produced a series of NE-SW-trending crater rows. The eruptions of its basaltic lavas were considered to have been restricted to a relatively short interval between about 6500 and 5500 years ago, but later work showed that some of the lava flows were radiocarbon dated at between about 7400 and 8900 years ago. Jakobsson S P, 1966. The Grimsnes lavas SW-Iceland. Acta Nat Islandica, 2: 6-30. Jakobsson S P, 1976. The age of the Grimsnes lavas. Natturufraedingurinn, 46: 153-162 (in Icelandic). There is no Deformation History data available for Grímsnes. There is no Emissions History data available for Grímsnes. Grímsnes is a relatively small volcanic system located SE of Thingvallavatn lake east of an en echelon group of volcanic fields extending across the Reykjanes Peninsula. 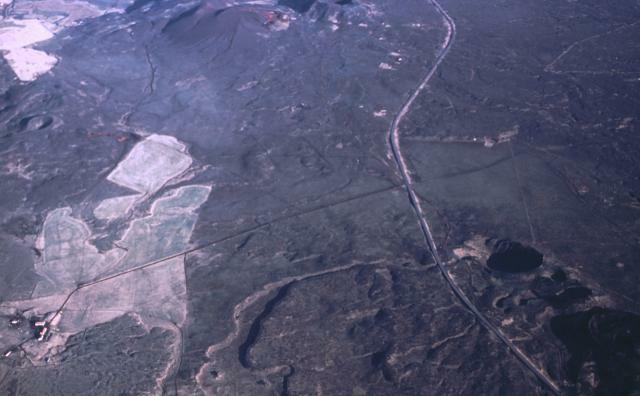 The Grímsnes volcanic field is seen here in an aerial view from the SW. Grímsnes lava flows cover 54 sq km and were erupted from a group of 11 fissures that produced a series of NE-SW-trending crater rows, such as seen at the lower right. The eruptions of the Grímsnes lavas were restricted to a relatively short interval between about 6500 and 5500 years ago. Photo by Oddur Sigurdsson, 1991 (Icelandic National Energy Authority). 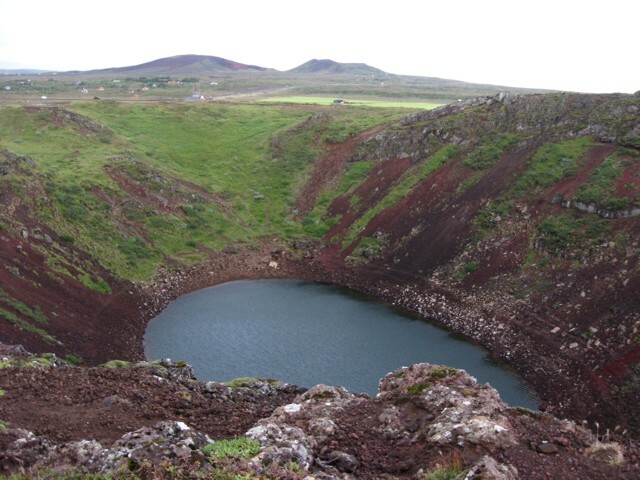 A small pond fills the bottom of the Kerid crater at the northern end of the Tjarnarholar crater row in the Grímsnes volcanic system. The crater is elliptic in shape, 270 m long, 170 m wide, and 55 m deep. Other cinder cones of the Holocene Grímsnes volcanic field are visible in the background to the north. Grímsnes lava flows cover 54 sq km and were erupted from a group of 11 fissures that produced a series of NE-SW-trending crater rows. The Global Volcanism Program has no maps available for Grímsnes. There are no samples for Grímsnes in the Smithsonian's NMNH Department of Mineral Sciences Rock and Ore collection. Catalogue of Icelandic Volcanoes (Link to Grímsnes) The Catalogue of Icelandic Volcanoes is an interactive, web-based tool, containing information on volcanic systems that belong to the active volcanic zones of Iceland. It is a collaboration of the Icelandic Meteorological Office (the state volcano observatory), the Institute of Earth Sciences at the University of Iceland, and the Civil Protection Department of the National Commissioner of the Iceland Police, with contributions from a large number of specialists in Iceland and elsewhere. This official publication is intended to serve as an accurate and up-to-date source of information about active volcanoes in Iceland and their characteristics. The Catalogue forms a part of an integrated volcanic risk assessment project in Iceland GOSVÁ (commenced in 2012), as well as being part of the effort of FUTUREVOLC (2012-2016) on establishing an Icelandic volcano supersite. Large Eruptions of Grímsnes Information about large Quaternary eruptions (VEI >= 4) is cataloged in the Large Magnitude Explosive Volcanic Eruptions (LaMEVE) database of the Volcano Global Risk Identification and Analysis Project (VOGRIPA).